For pictures of 2018 CAAPA Events, please click here. 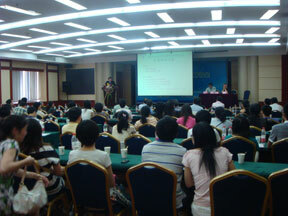 Associate Dean Jiannan Wu and conference coodinator of the 2nd Chinese Public Administration Scholars Forum in 2011 addressing the attendees at Xi'an Jiaotong University, Xi'an, China. 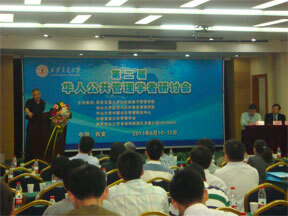 Dean Jun MA of Sun Yat-Sen University (Guangzhou, PRC) and founding member of CAAPA, addressing the attendees of the 2nd Chinese Public Administration Scholars Forum in 2011 at Xi'an Jiaotong University, Xi'an, China. 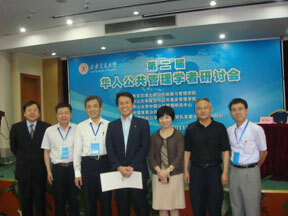 Professor Jiannan WU of Xi'an Jiaotong University, Dean Zheng-wei ZHU of Xi'an Jiaotong University, Dean Lan XUE of Tsinghua University, Professor Tou Liou of Central Florida University and President of the American Society for Public Administration (ASPA), Professor Tsai-Tsu SU of National Taiwan University, Dean Jun MA of Sun Yat-Sen University, and Professor Alfred T. Ho of University of Kansas and President of the China-America Association of Public Affairs (CAAPA). CAAPA organized two conference panels related to the Chinese public administration development at the annual conference of the American Society of Public Administration (ASPA) in Baltimore, U.S.A. on March 11-15, 2011. CAAPA and the School of Public Administration, University of Nebraska at Omaha jointly organized and sponsored a one-day symposium on China studies on October 6th, 2010 on the campus of the University of Nebraska-Omaha in the newly renovated home of the College of Public Affairs and Community Service. The symposium covered a wide range of topics related to China, including fiscal decentralization and regional development, financing infrastructure and public debt, financing public education and population migration, and budgeting reform and comparative studies. During the symposium, CAAPA President, Dr. Yilin Hou, also presented its Outstanding Contribution Award to Mr. William Joseph Sullivan, Assistant Dean of the Maxwell School of Citizenship and Public Affairs at Syracuse University. 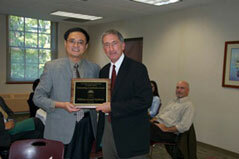 Yilin Hou, former President of CAAPA, presenting the service recognition award to William Sullivan, Assistant Dean for External Relations of the Maxwell School of Syracuse University at the 2010 Omaha conference.